The Saturn brand has always been a bit of an odd duck for GM. Since its inception in 1990 as a whole new way of doing business, GM has systematically taken the differences out of the mix and brought it under the wing of its mainstream operations. Gone are the polymer dent-resistant panels and rather odd-looking futuristic designs that seemed to find a niche market amongst the more creative souls in the marketplace. 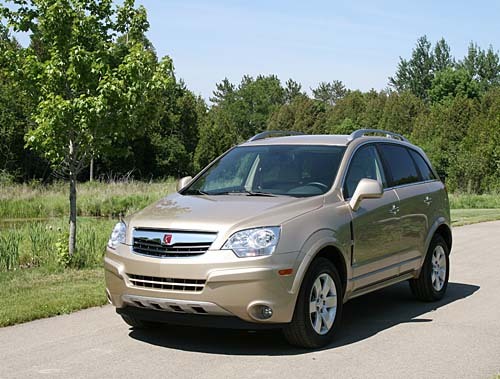 The 2008 Saturn Vue is based on the Opel Antara and rides atop a re-worked version of the 2007 Vue platform; however, apart from the 2707 mm/106.6-inch wheelbase, there’s little that would indicate the similarity in DNA. The European styling is a welcome change from the outgoing model and reflects some elements displayed on the Sky, Aura and Outlook. Under the hood, buyers have a choice of four trim levels – XE, XR, Red Line and Green Line. Three gasoline engines are scattered amongst them, a 2.4L Ecotec four or 3.5L V6 for the XE and the 3.6L VVT V6 for the XR and Red Line. The big news is the presence of two Hybrid options in the Green Line model, either 4- or 6-cylinder versions. The 4-cylinder model will reportedly offers a 20 percent savings over the conventional gas option, whereas the 6-cylinder package will come with two-stage technology and yield a 45 percent reduction in fuel consumption. All-Wheel Drive is also on option on all 6-cylinder models. The interior of the new Vue is another radical yet welcome departure from earlier models. First off, either the German designers or Korean engineers shrunk the “A�? pillars on either side of the windshield, allowing improved outward visibility especially at the base of the pillars. The exterior mirrors now sit away from the door creating an opening for viewing pedestrians. The window lifts are where drivers expect them to be, on the door panels not on the dashboard or console. Interior appointments speak to the European influence already reflected in the Aura, with handsome trim fabrics and materials, jewel-like chrome bezels highlighting logical and legible gauges, and rotary heating/AC controls. The nicely contoured and supportive drivers seat sits behind a thick-rimmed, padded three-spoke steering wheel which would look at home in any sports sedan. While the base price has risen somewhat, the list of standard equipment now includes items that were available as options on earlier models and a few that were not available, period. If the 2007 base model were optioned to match the standard XE FWD model today, the sticker would be almost $1000 more than the current sticker of $26,990 (AWD $31,275). The FWD XR starts at $31,335 ($33,920 AWD). The XE comes with 16-inch alloy wheels, while the XR rides on 17-inch alloy rims. The Red Line package while retaining the 3.6L engine, adds larger 18-inch wheels, a sport suspension and an aggressive body appearance kit for a list of $36,020 ($38,605 AWD). Some brief time behind the wheel of a FWD XR model with the 3.6L engine mated to an all-new 6-speed automatic transmission, confirmed that the new Vue’s beauty was more than skin deep. A refined suspension produced a comfortable ride over mixed terrain and road noise was remarkably restrained, even on these early pre-production models off the assembly line in Mexico. My co-driver’s emergency stops on loose gravel, besides raising my blood pressure, proved the effectiveness of some of the safety controls, mainly the StabiliTrak and braking system. Whether it’s the use of steel panels as opposed to the polymer sheets used on the outgoing model, the Vue has gained a bit of weight in the redesign, 480 lbs on the 4 cylinder model and 634 lbs on the V6 AWD XR model. Fuel economy appears improved according to GM, most likely due to the new 6 speed transmission used on the V6 models versus the 5 speed unit used previously. Overall the Vue benefits from GM’s efforts to impart a stronger brand image to Saturn. The halo effect of the Sky reflects favourably on the entire line-up and the international influence gives buyers a worthwhile alternative in the marketplace. The 2008 Vue sits better able to challenge a wave of Asian alternatives without the quirky personality of the outgoing model.